Here are 21 top Arabic mehndi designs for bridesmaids. 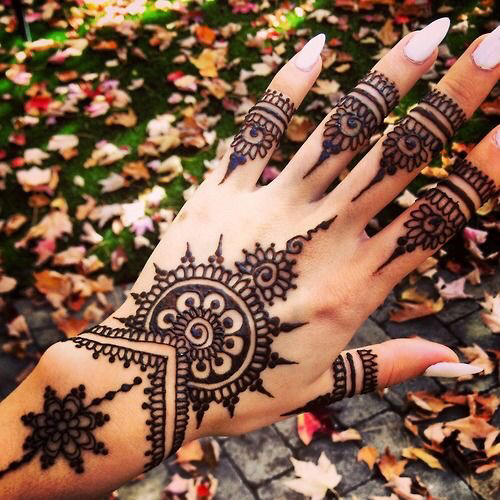 Decorate your hands with these stylish mehndi designs! Friend getting married this winters and you are her bridesmaid? Wow! Other than the bride, there is so much prep that you require as well. Your attire, footwear, hairstyle, makeup and what about the mehndi design? It has to be unique and lovely at the same time. It is advised that with such little time in hands and so much exertion to do, you must aim for a minimalistic design that beautifies your hands and gives you an overall chic look. Being an Indian bridesmaid is not an easy task. She has to do all the running around to ensure her friend is not much stressed. With back-to-back ceremonies to attend on your best friend’s D-day, it really gets too stretched for a bridesmaid to get much time for herself. So, take some time off on the Mehndi Night and get yourself a breather. Zuri recommends you pamper yourself because it’s much deserved. Sit back and get your hands painted! We have compiled 20 really easy nonetheless super sassy Arabic mehndi designs for you to choose from. The mehndi patterns are free-flowing and usually scattered with clear motifs generally representing flowers, vines, leaves and even geometrical designs. Arabic mehndi is customarily very intricate and the best part about wearing one is that you can flaunt it on your wrist, fingers, and palms, back of your palms, feet, ankles, arms and shoulders. It looks so stylish! So, enjoy yourself and don’t forget to ask your friends to pick a design for themselves too.